Wherever you go, at work, at school, at gym or at a church meeting, you almost always meet someone who has a back pain. In real life, back pain is one of the top reasons patients seek for acupuncture treatment. It makes sense since countless studies have shown that acupuncture is highly beneficial in the treatment of back pain and sciatica. In fact, when it comes to back pain, British research has revealed that acupuncture can be more effective than prescription drugs and even surgeries. In short, it works. 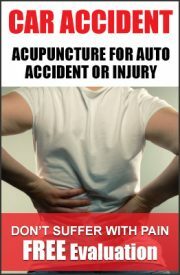 That’s why acupuncture is the top choice of treatments for millions of people all over the world for low back pain. Your back may have been abused for years from bad posture, sitting in the traffic for hours, crouching in front of a computer all day, or heavy lifting at the gym or at work, and finally decided to give up with a “pop”, silently screaming with sharp pain. If sciatic nerve, the longest nerve in the body (including the branches), is affected in this process you may experience pain traveling down the leg or some tingling and numbness as well. At an early stage, simple back pain may disappear with rest and over-the- counter medications. However, if not properly treated, about a quarter of the back pain will progress to become a chronic problem – one of the most common reasons people miss work for. Don’t let that happen to you. Simple acupuncture treatments can save your back from devastating pain in the coming years, and rescue your back from further suffering. More and more people are staying away from strong prescription pain killers because of their harsh side effects. Why would you swallow those strong chemicals when there are such simple and more effective solutions such as acupuncture, moxibustion, exercise, stretching, and herbs? When there’s inflammation in the body, stem cells naturally flow to the affected area to heal the injury. Some researchers noted that taking pain killers actually stops the stem cells from flowing into the area. In practice, it’s common to see that for those who take pain killers regularly it takes longer to recover. When you take acupuncture, white blood cell count increases to reduce the inflammation, and also the level of endorphin increases which reduces the pain. Of course pain medications have their places in medicine and play a very important role to help the patients. But for many pain disorders such as back pain, especially at the early stage, it may not be necessary or plausible to rely on heavy-weight medications. Whether you are suffering from a back pain as a result of serious injury, a herniated disc, sciatica or even stress, acupuncture may be the best treatment option for you. Acupuncturists use different points for different purposes. Trigger points are used to alleviate pain including referred pain, local points are used to reduce inflammation and to loosen up soft tissue, and meridian points are used to facilitate circulation and to restore balance, which in turn, reduce pain and quicken the healing process. Despite the excellent result, some people are concerned that they may have to take acupuncture for a long time. In reality, with proper treatment, acute back pain can often be cleared up in a few sessions. Chronic back pain would take more sessions, but as you get more treatments, you will experience many other positive effects of acupuncture. In general, you are advised to take frequent treatments at first, and then taper off as the pain diminishes. Another surprising “side effects” of acupuncture is, patients who receive acupuncture tend to have more energy, move more easily with less pain, sleep better, and take less pain medication while feeling better in general for no particular reasons. This is possible due to increased free flow of energy. Unlike other allopathic medicine, acupuncture is a “wholistic” medicine in which the practitioner looks at the whole body, rather than just the injured area, before deciding on the treatment protocols. At Chang’s Acupuncture, we often combine acupuncture with electric stimulation, moxibustion, cupping, tuina, and stretching to treat lower back pain. They all work together to relieve pain, reduce inflammation and promote circulation to help healing. Call us or send us an email today to find out if acupuncture is the right treatment option for you to be free from the never-ending low back pain.